To enter, simply head over to our facebook page, and comment on the #HafeleHampervideo post with the amount of times you can spot the mini Christmas tree (pictured above) throughout the video. All entries must be received before 11:59pm on Tuesday 19 th December. This competition is open to people who are UK residents aged 18 years and over, excluding employees of Häfele UK (the ‘Promoter’) and their affiliates or agents and their families. The competition opens at 12.00pm BST on 06/12/17 and closes at 23:59 on 19/12/17. Any entries received after this time and date will not be eligible for the competition. 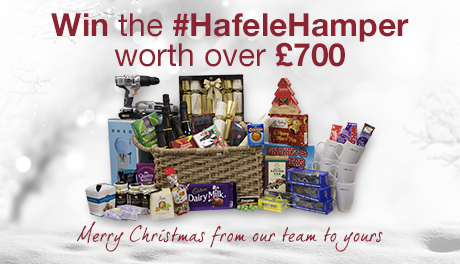 To enter and win the competition, entrants must comment on the #HafeleHamper video post on the @Hafeleukltd Facebook page with the amount of times they can spot the mini Christmas tree throughout the video. No purchase is necessary to play. One entry is valid per person. The Promoter does not accept liability for incomplete entries or entries lost in the course of transmission. This competition is in no way affiliated with or endorsed by Facebook. There will be 1 (one) winner in total which will be selected at random from all eligible entries. The selected winner will win a hamper of Christmas gifts, as well as additional products that are the same, or similar to, those shown in the video. The winner will be notified by direct message within 48 hours of selection. The winner can claim their prize by responding to this message from Häfele UK. The winner will have 28 days to claim their prize. If a winner fails to claim their prize within 28 days of notification the prize will be forfeit. Prizes will be sent via courier within 28 days of the winner claiming the prize. Häfele take no responsibility for prizes that are damaged during delivery or that fail to arrive. The winner will be required to take part in post event publicity. This will include photographs for trade press / local press and social media posts for up to 6 months. The Promoter reserves the right to substitute prizes or any part thereof with items of equal or greater value in the event of unavailability due to circumstances beyond the Promoter’s control. The Promoter may disqualify an entrant if the entrant acts with intent to annoy, abuse, threaten, or harass any other entrant, Promoter, or Promoter's agents or representatives. Anyone deemed to be cheating or otherwise manipulating the game to give themselves an unfair advantage will also be disqualified. Any entrants deemed to be in breach of any of the T&Cs will be disqualified. By entering the competition, entrants will be deemed to have agreed to these T&Cs. The Promoter accepts no liability for any tax liability that may become due as a result of winning a prize. This will remain the sole responsibility of the winners. The Promoter reserves the right to amend the terms of this competition or cancel the competition if circumstances beyond its control occur.